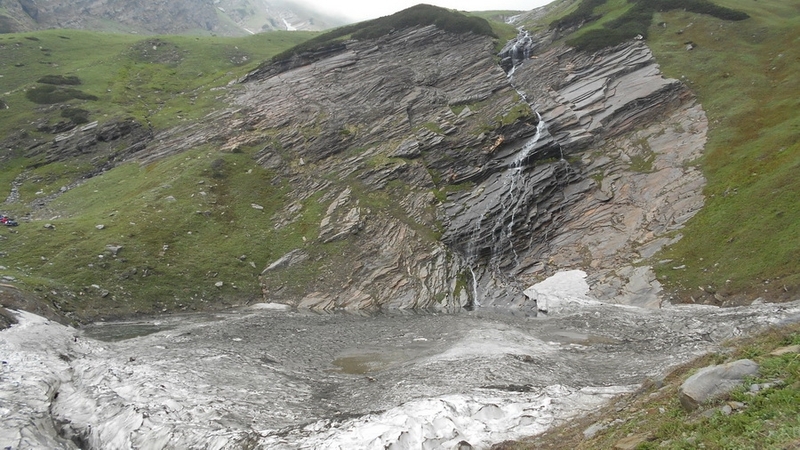 Beas Kund - Beas so named after Rishi (Sage) Beas and Kund is Hindi word for a tiny pond. 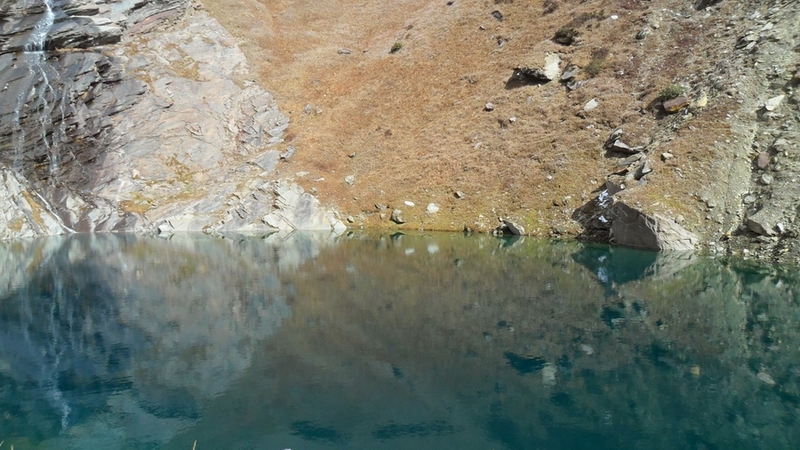 This tiny lake of Beas Kund situated at the higher and upper valley of Solang. 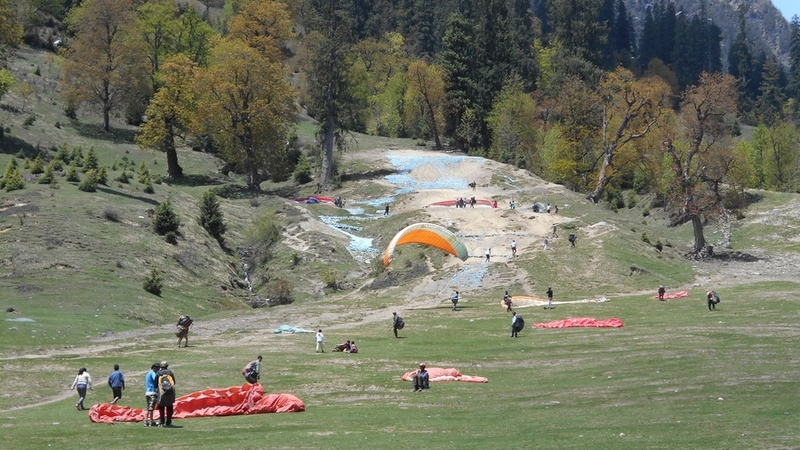 Which is a heart of winter and summer games in Manali. 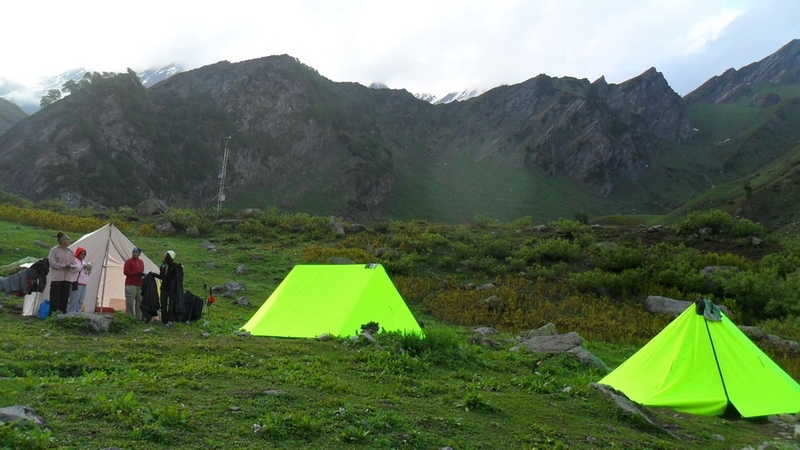 It’s an ideal base camp for climbing nearby peaks Shitidhar, friendship and Ladakhi peak. 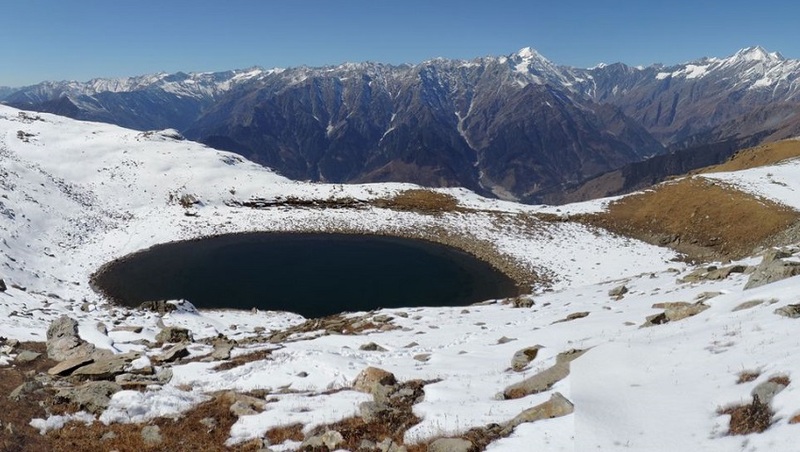 The West side of Beas Kund is a magnificent peak of Hanuman Tibba 5990m, which access through a tiny pass of above this lake. 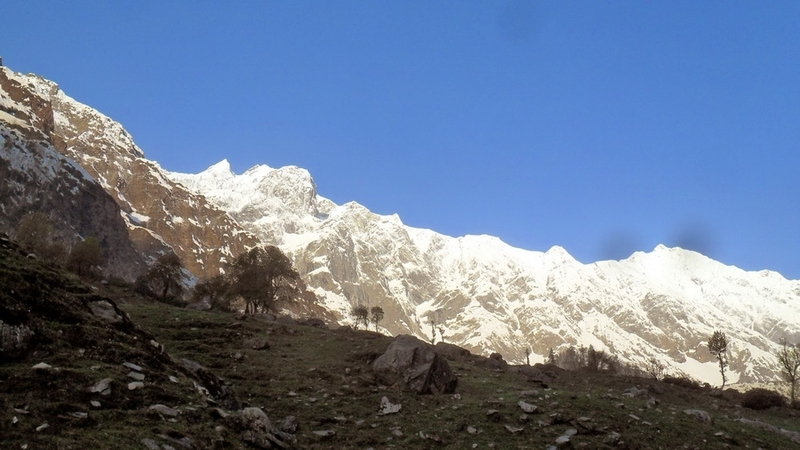 Day 1: Manali - Solang, drive 14 km, 45 minutes, trek to Dhundi (2840m) - Bakarthach (3300m). 6/7 hrs. 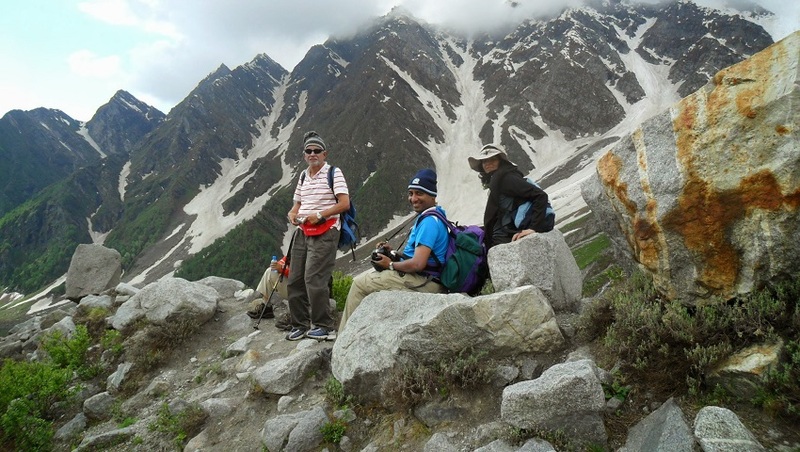 Day 2: Trek to Beas Kund (3690 m). - Back to Bakarthach 6-7 hrs. 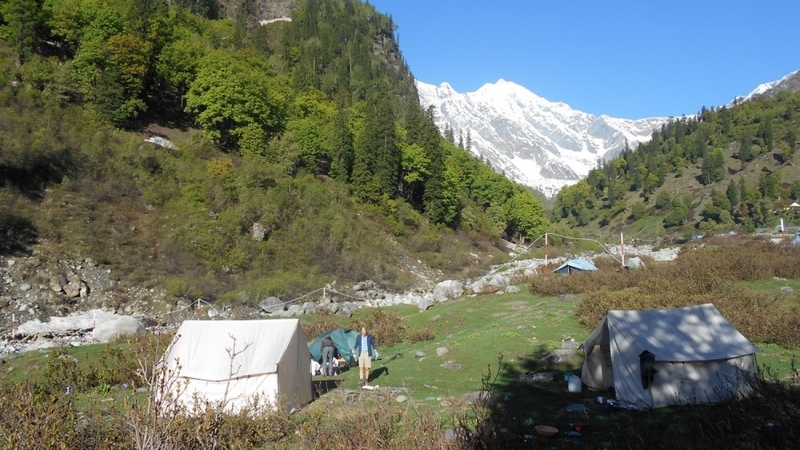 Day 3: Trek to Dhundi - Solang, 6 Hrs, Drive to Manali 30 minutes. 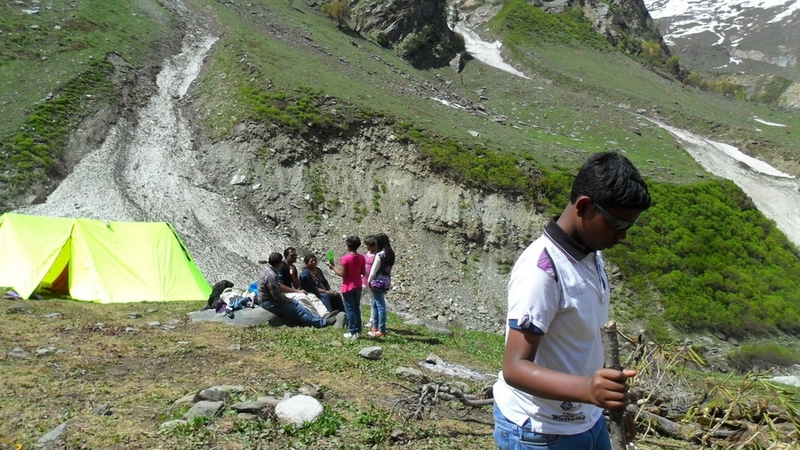 DAY 1: MANALI - SOLANG, DRIVE 14 km, TREK TO DHUNDI(2840m) - BAKARTHACH (3300m) 6/7 Hrs. 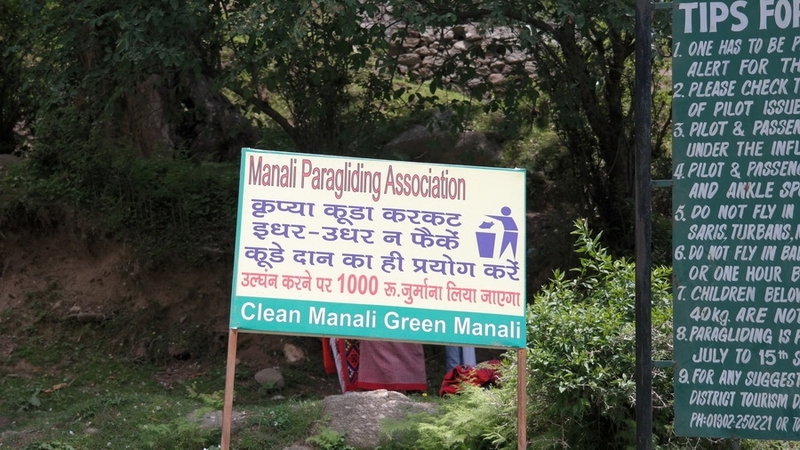 From Manali, we drive 14 km to Solang which is the starting point of our trek. 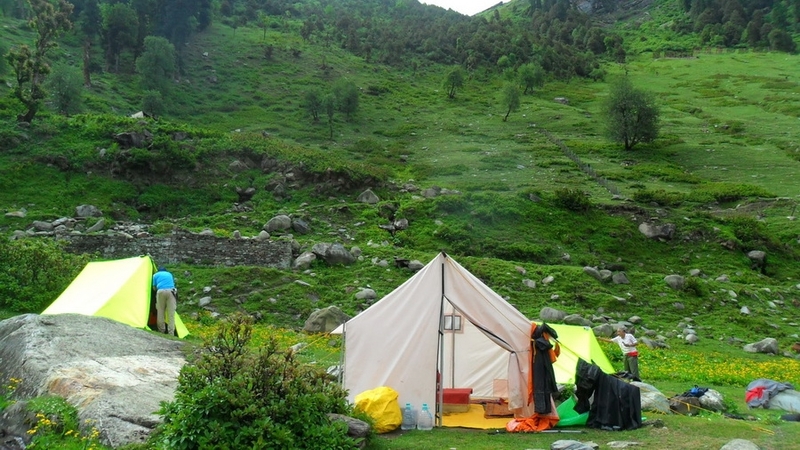 It offers a spectacular sight of snowcapped mountains. 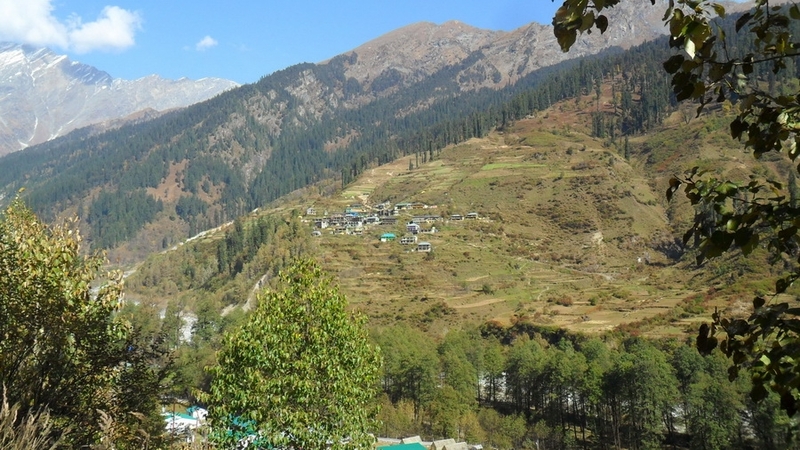 From Solang, an 8 km level walks on the right bank of River Beas, through the forest of oak, fir, and walnuts lead to Dhundhi. 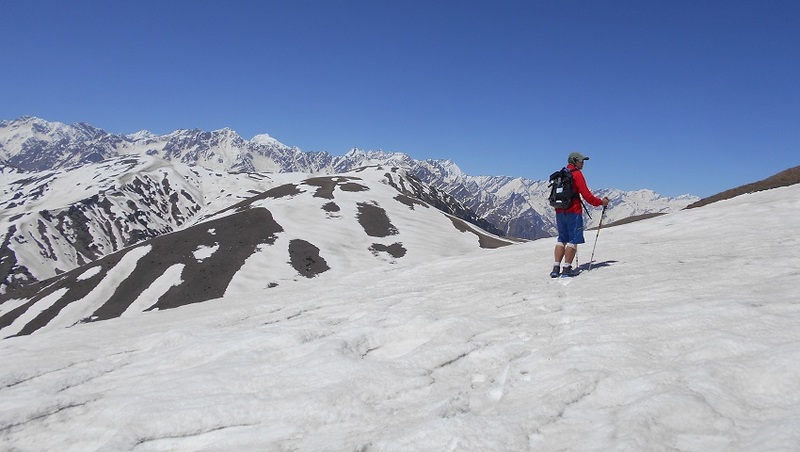 Enroute we get a glimpse of Deo Tibba 6001 meters. 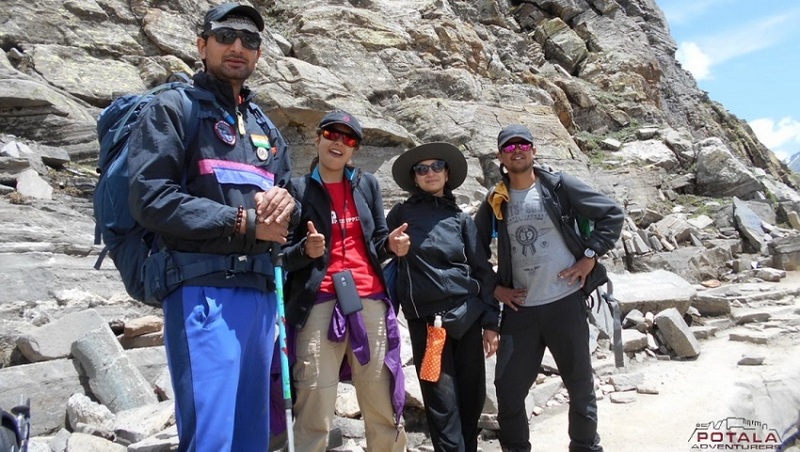 And Indrasan peak 6220 meterss., We cross Dhundhi 2840 meters. 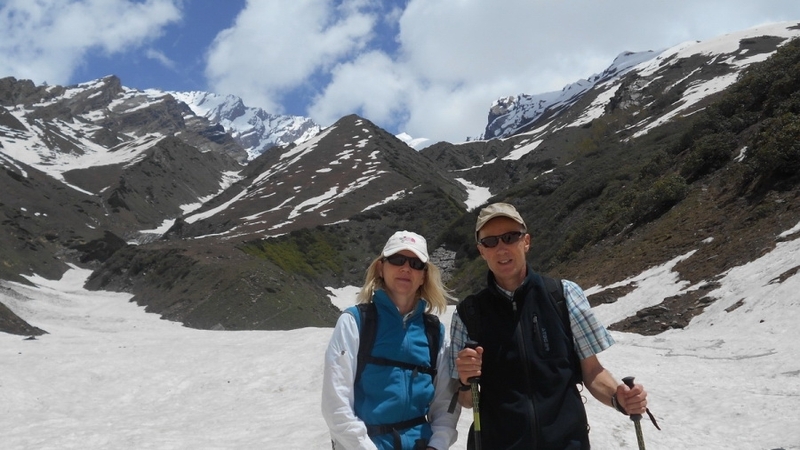 Having a glimpse of Hanuman Tibba 5990 meters. We now climb gently to Bakerthach crossing a small bridge. Camp. 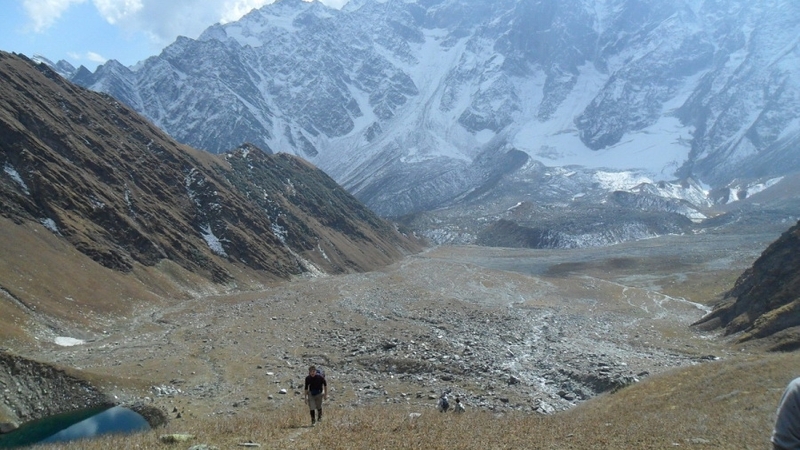 DAY 2: TREK TO BEAS KUND (3690m) - BACK TO BAKARTHACH (3300m) 6-7 hrs. 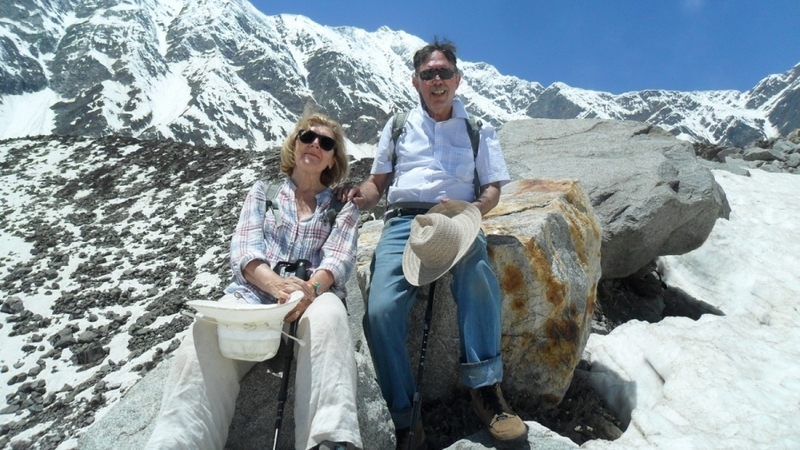 Today after breakfast we climb gently to Beas Kund, through boulders and rocks for a few minutes. 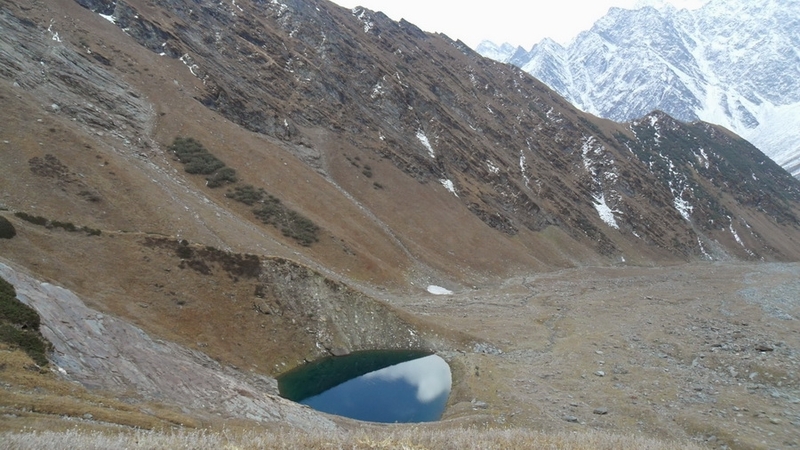 We will now soon discover tiny lake of Beas Kund, believed to be the source of River Beas. 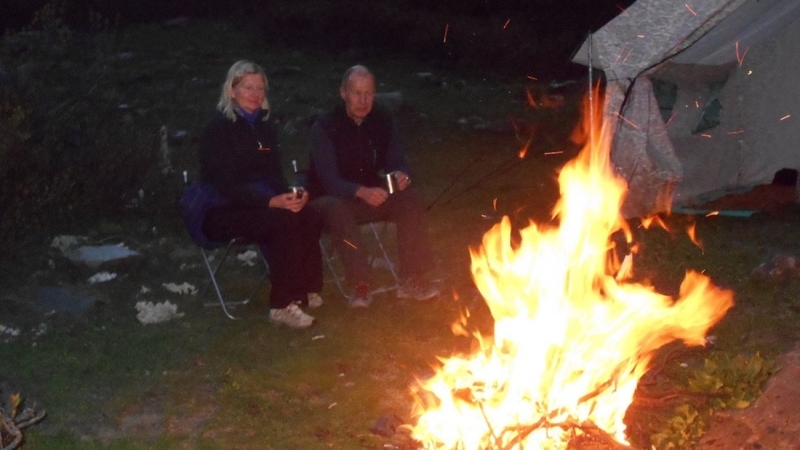 And of course base camp for the wonderful summits around ie. 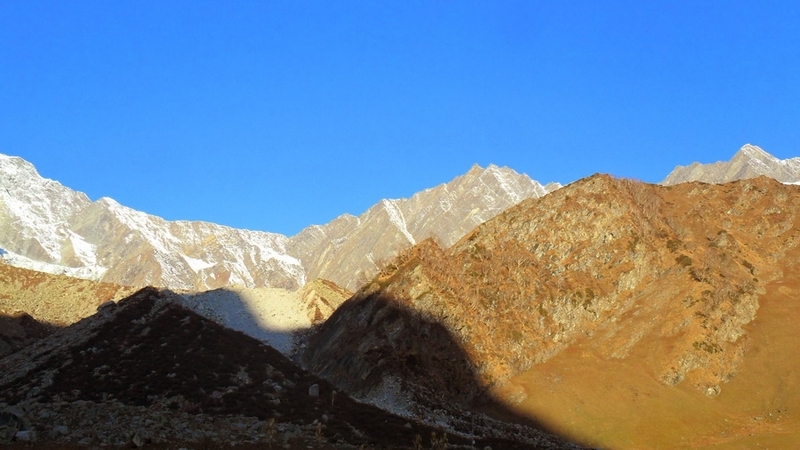 Shitidhar, Ladakhi, Friendship peaks. 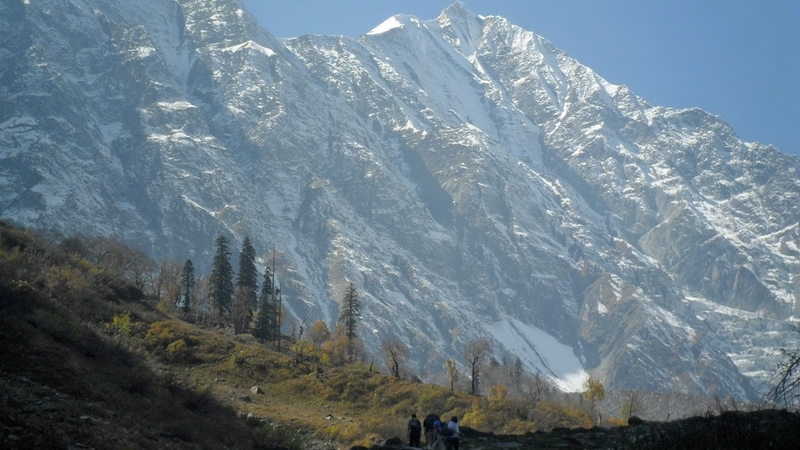 A good trekker can climb these peaks by leaving Beas Kund at early. 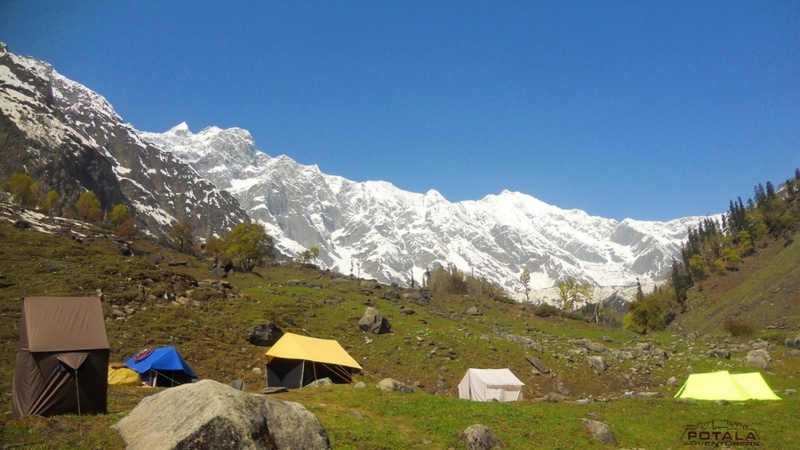 The peaks above 6000m are Makerbeh and Shikhar Beh. 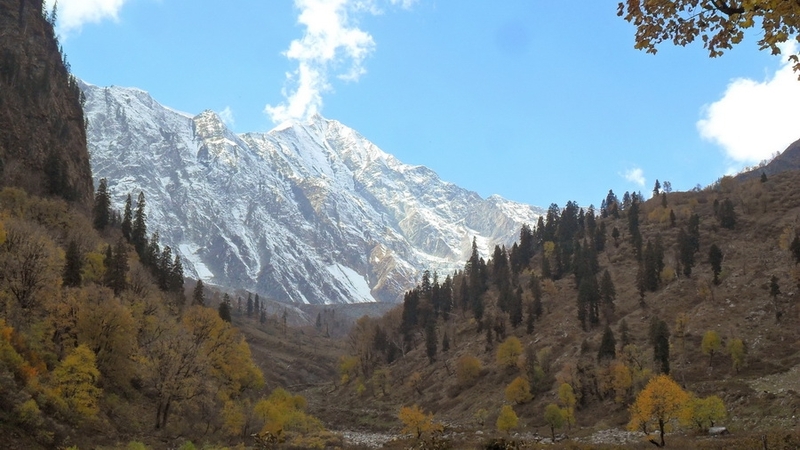 Lahaul valley region lies to the north of Beas Kund just behind the great wall of these mountains. 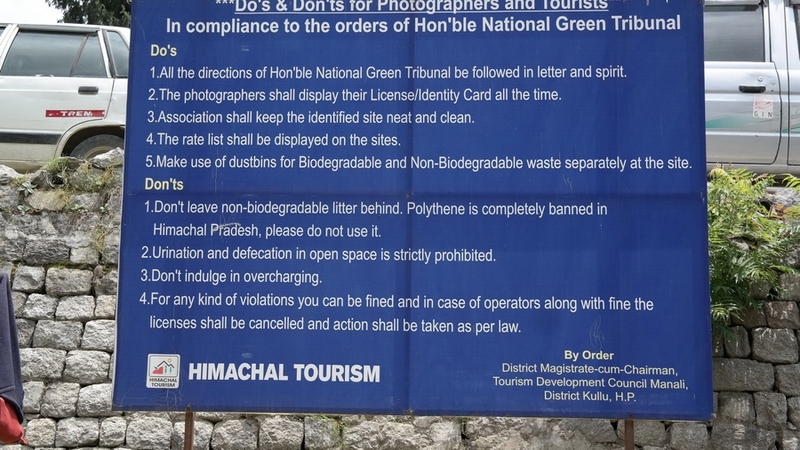 To the west Kangra and the lower region of Himalaya known as Dhauladhar range. 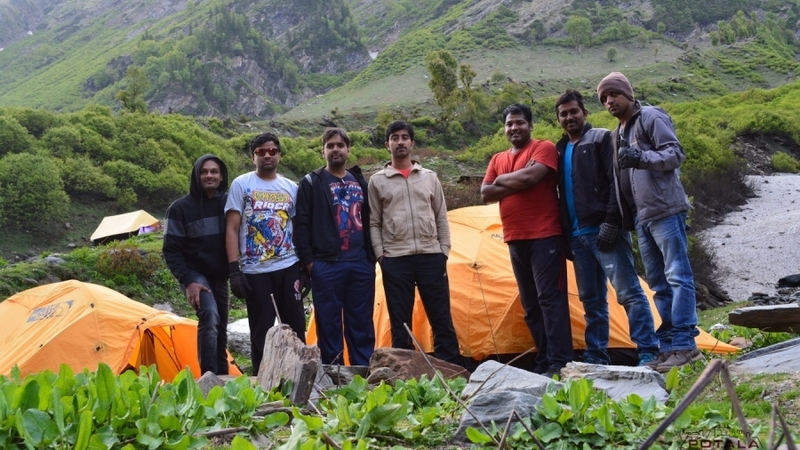 Visiting around the lake we retrace back to Bakarthach camp for overnight stay. 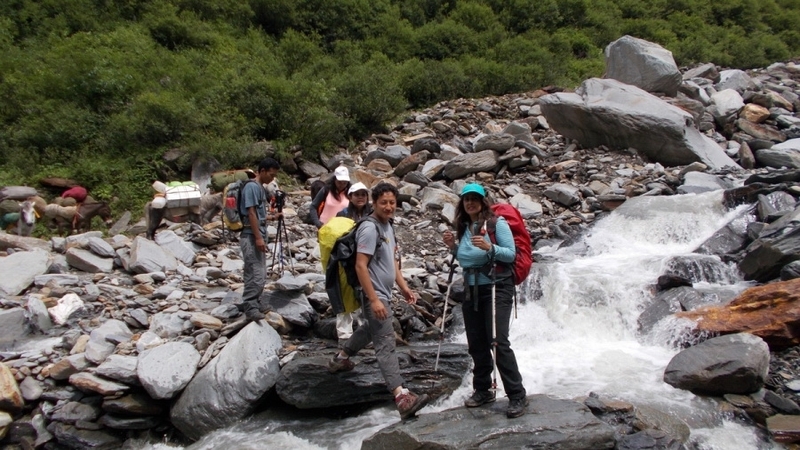 Today we descent gradually back to Dhundhi and further to Solang. 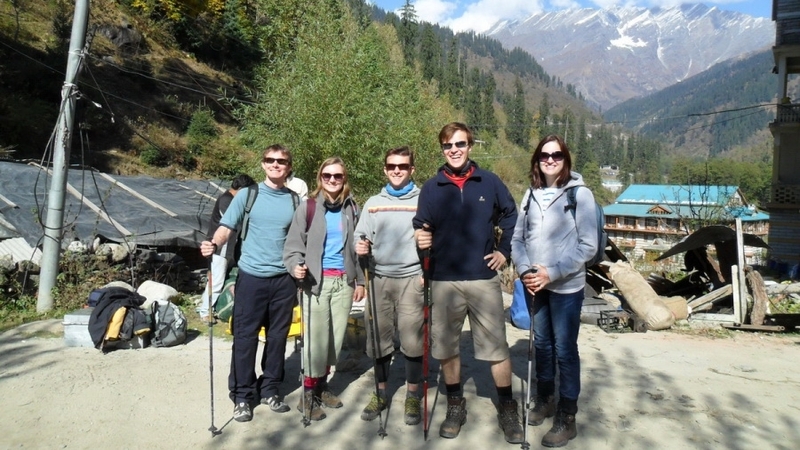 We spent a few hours to explore the adventure activities at Solang. 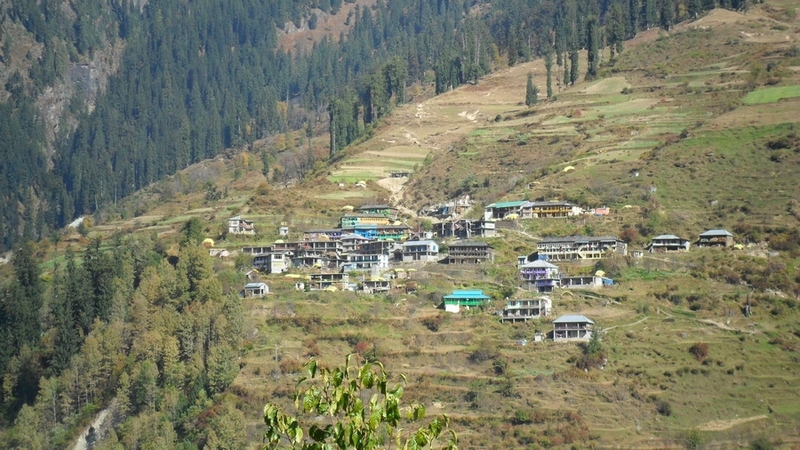 Drive back to Manali. "I am glad that I chose your company to take the women's group. I was happy with your professionalism of your staff food, the arrangements. All was well done. You are welcome to also formally tie up with my company impact mountaineering will be back again in Sept and Dec."
“Excellent service 5*. Staff very co-operative. Food was good, on time, great service. Transparency in the deal was very excellent. 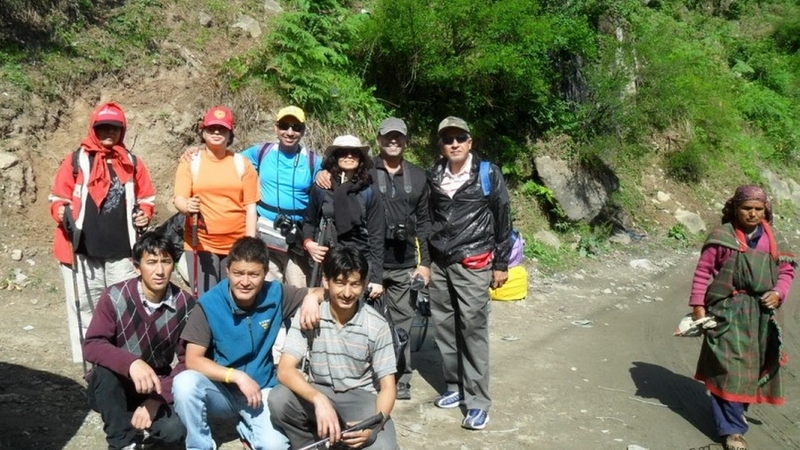 Guides were very good & accommodating staff was also helpful as we were family we did not find it difficult trekking. Food items well planned. 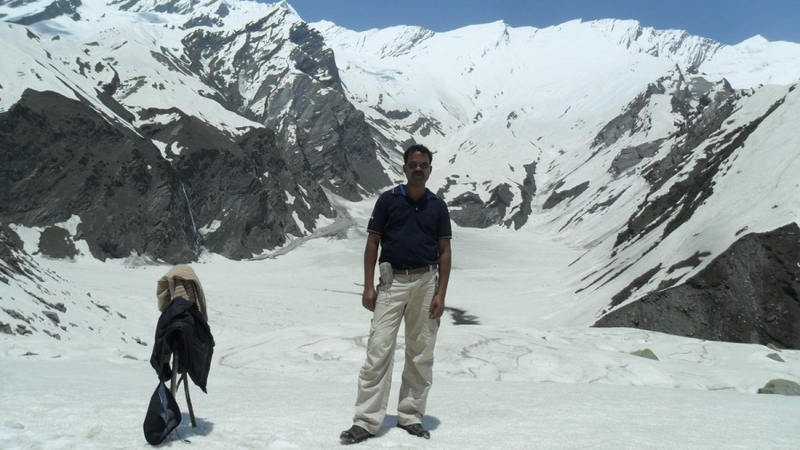 Some words for the staff – Captain was excellent in conducting the whole adventure trip to Beas Kund. Supporting guide was also very helpful during the trip. Cooking staff also very nice and excellent. The chef was excellent. The horseman was excellent. " 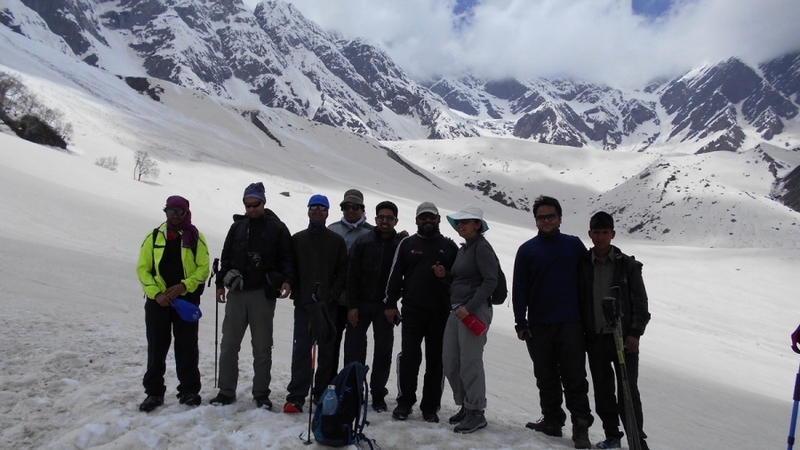 “Dear Prem, Thank you so much for organizing such fantastic trek on Beas Kund. We had an amazing time. 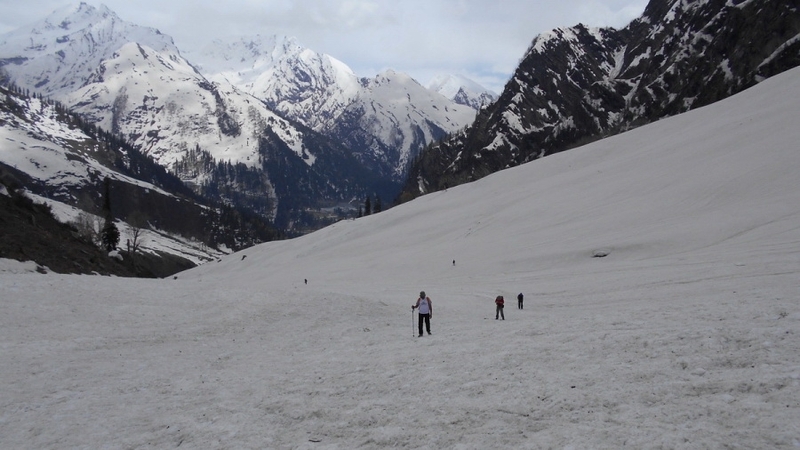 The views are certainly stunning + although the trek was slightly tough in places, the scenery around made up for it. Our main guide Dharam was superb. He is very knowledgeable + very patient. We felt completely safe with him. He guided Lynne overall difficult stretches and never hurried us. He is a good man. Our second guide Rajesh was also very patient + very attentive – again we felt very safe with him + it was good to have 2 guides. Our main cook Mani produced the most amazing meal + packed lunch. He was always smiling + delicious food was great to welcome when we go back from the trek. All the porters were friendly helpful too. Many thanks for the superb experience. 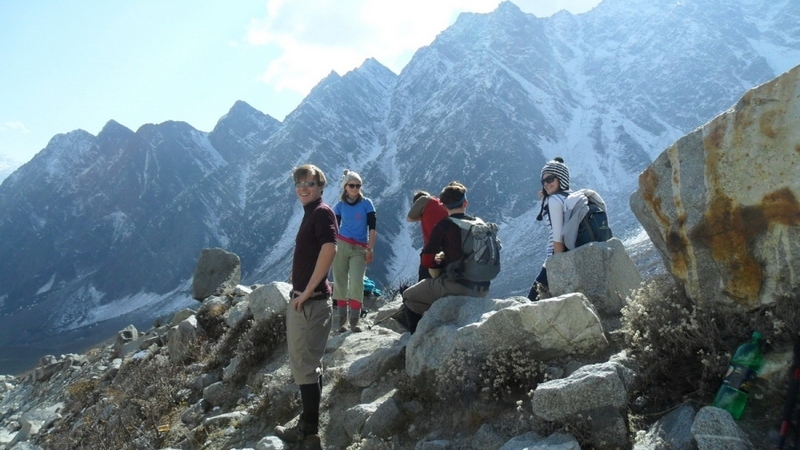 We will certainly recommend Potala for trekking. Cheers. " “As planned, we all had a great time for this vacation. Thank you for the great tour plan from you. 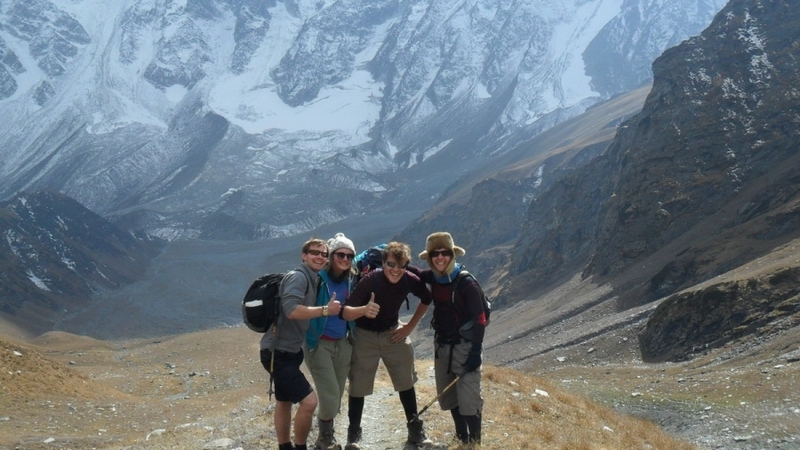 We all had a good time in this adventurous trek. Especially the food was excellent. 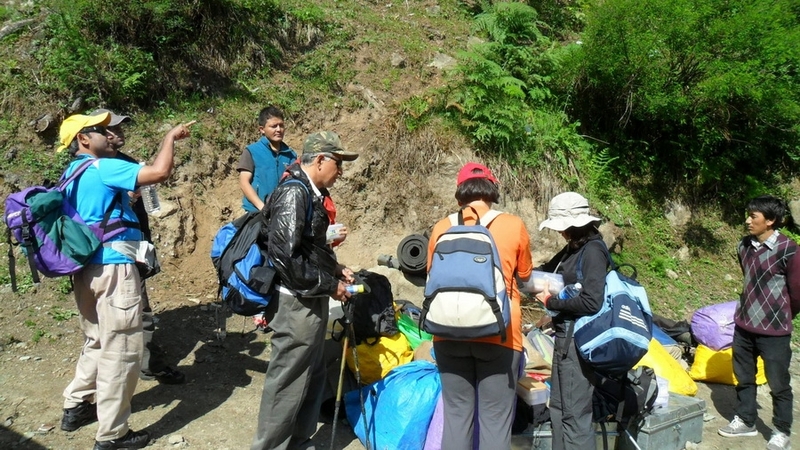 As always we will look forward to join the adventurous tour plan provided by you. Hope we will meet soon for the next adventure. Very soon. Thank you. " 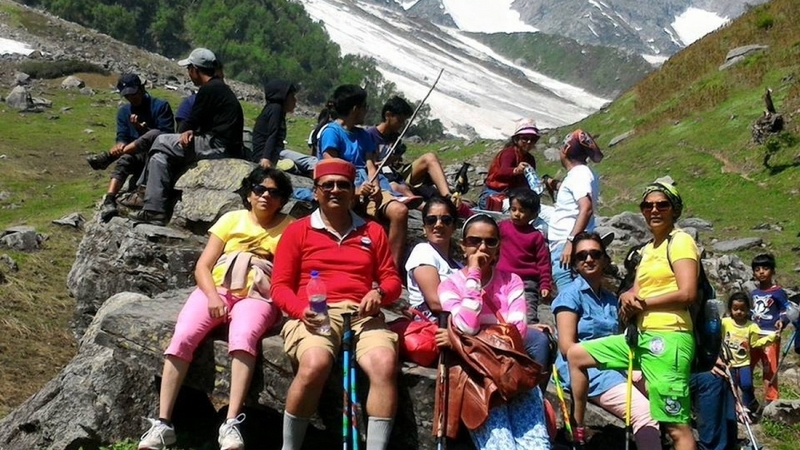 Day 1 Manali - Solang - Dhundhi(2840m), drive 12 kms, trek to Bakerthach. 6/7 hrs. 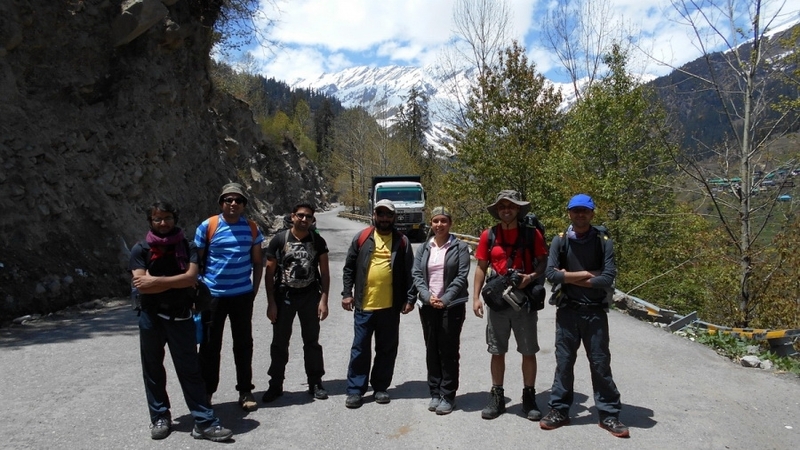 From Manali we drive 12 kms to Solang which is starting point of our trek. 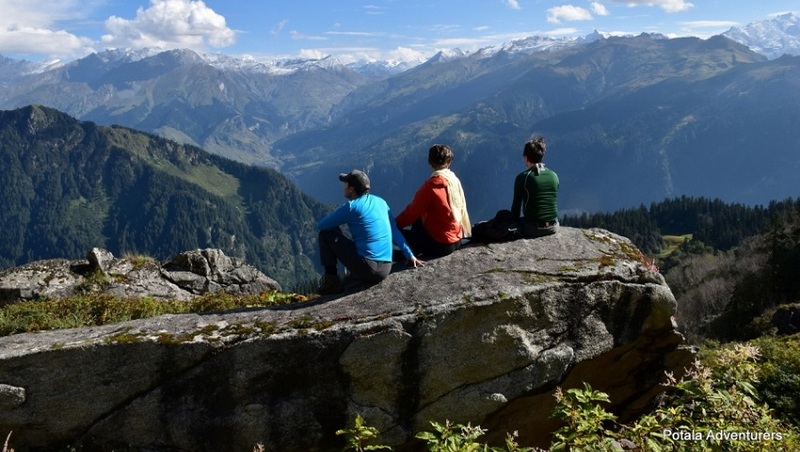 It offers a spectacular sight of snowcapped mountains. 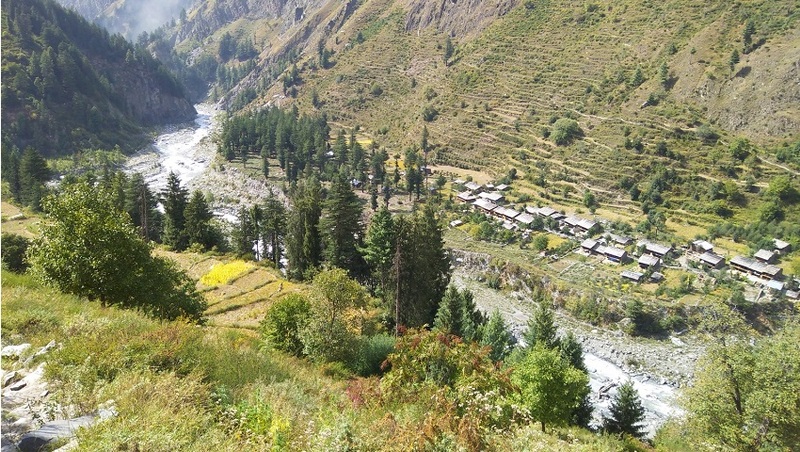 From Solang an 8 kms level walks on the right bank of River Beas, through forest of oak, fir and walnuts, leads to Dhundhi. 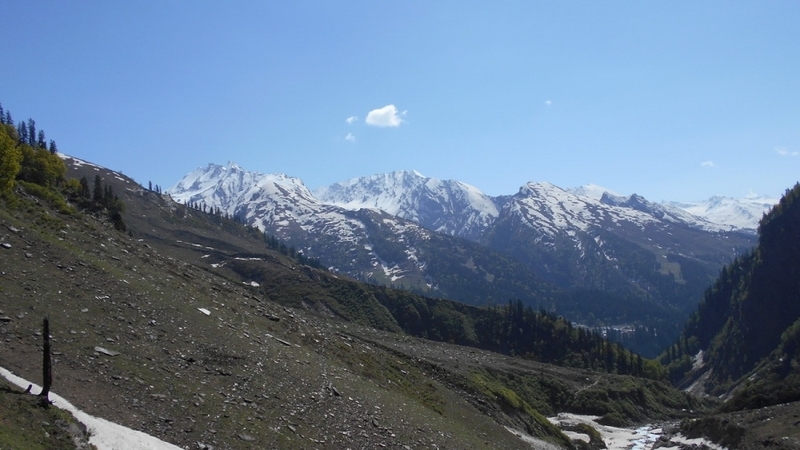 Enroute we get a glimpses of Deo Tibba 6001 mtrs. 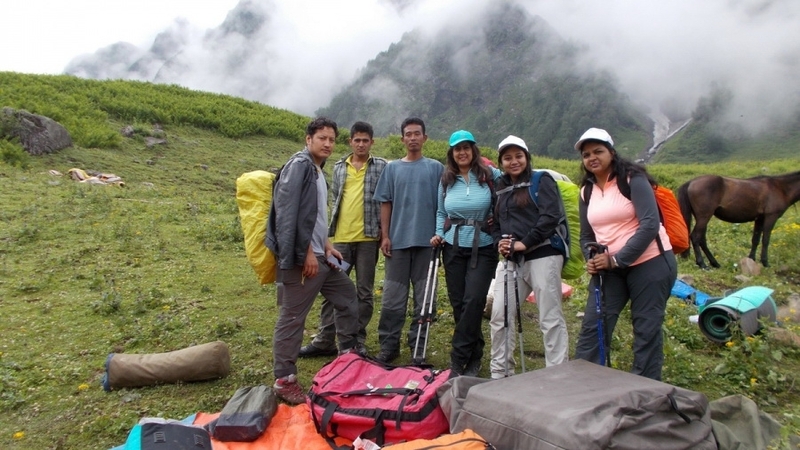 And Indrasan peak 6220 mtrs., We criss Dhundhi 2840 mtrs. Having glimpse a glimpse of Hanuman Tibba 5990 mtrs. We now climb gently to Bakerthach crossing a small bridge. Camp. 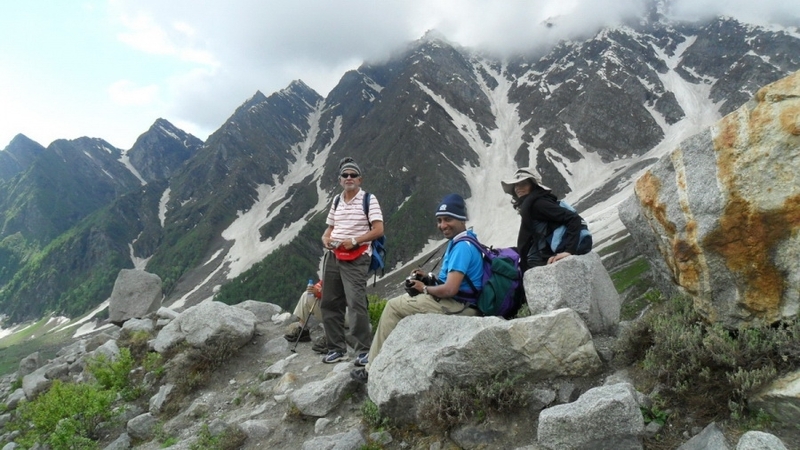 Day 2 Trek to Beas Kund 3690 m. - Back to Bakarthach 6-7 hrs. 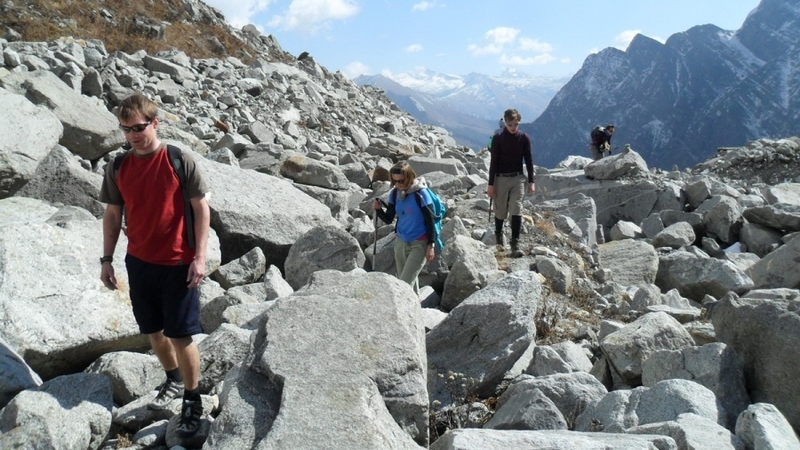 Today after breakfast we climb gently to Beas Kund, through boulders and rocks for few minutes. 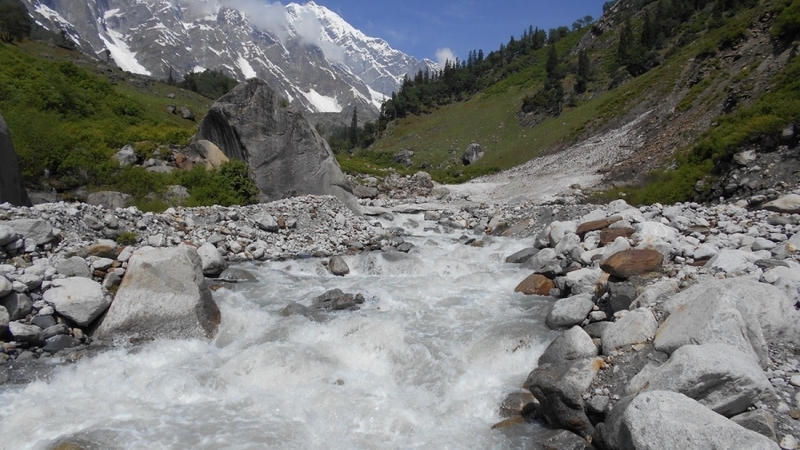 We will now soon discover tiny lake of Beas Kund, believed to be the source of River Beas. 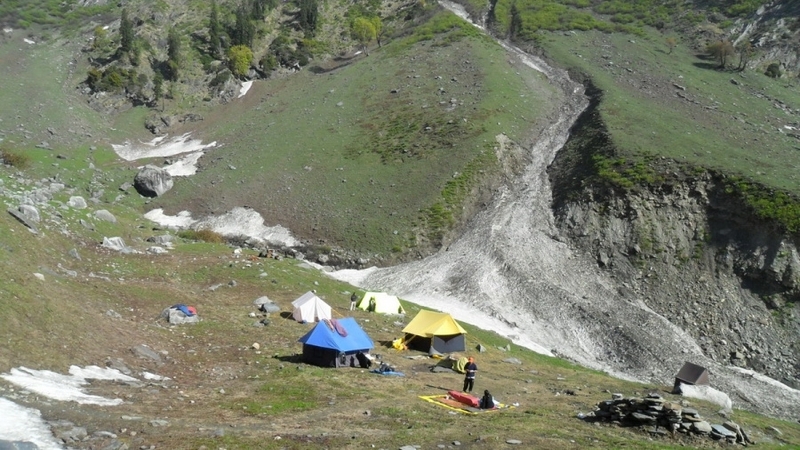 And ofcourse base camp for the wonderful summits around ie. 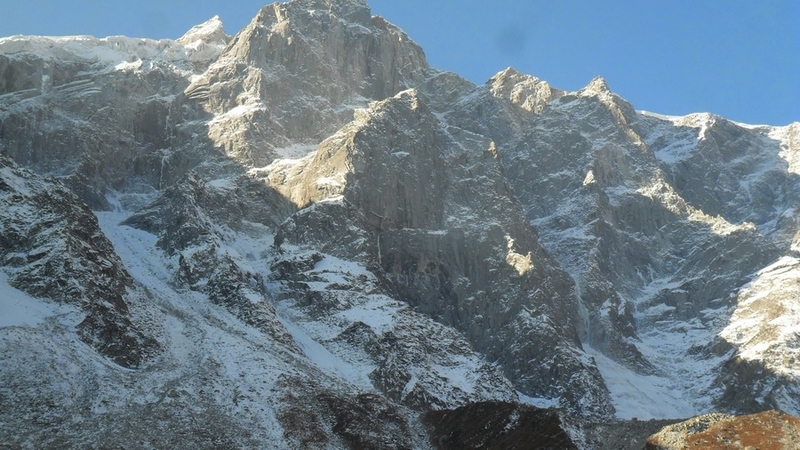 Shitidhar, Ladakhi, Friendship peaks. 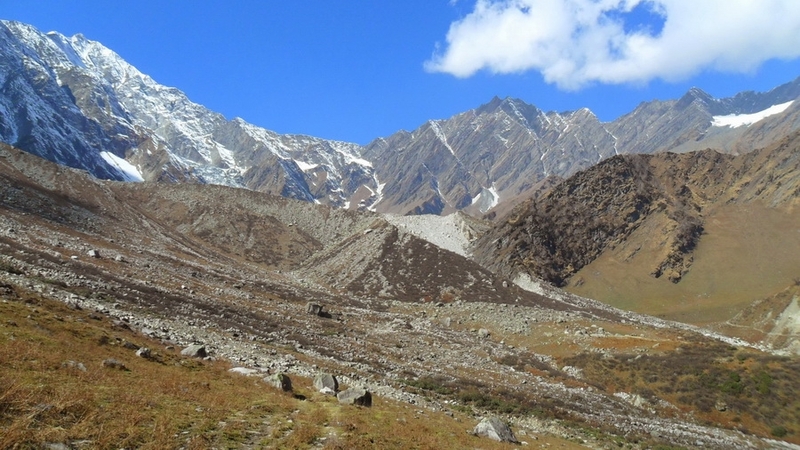 A good trekker can climb these peaks by leaving Beas Kund at early. 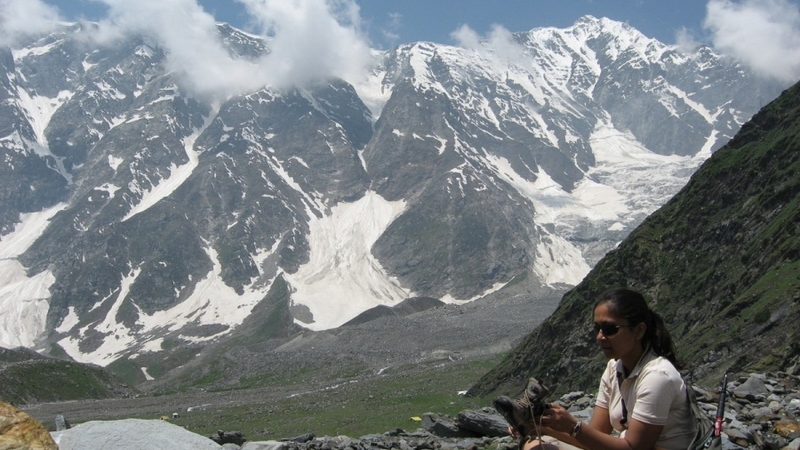 The peaks above 6000m are Makerbeh and Shikhar Beh. 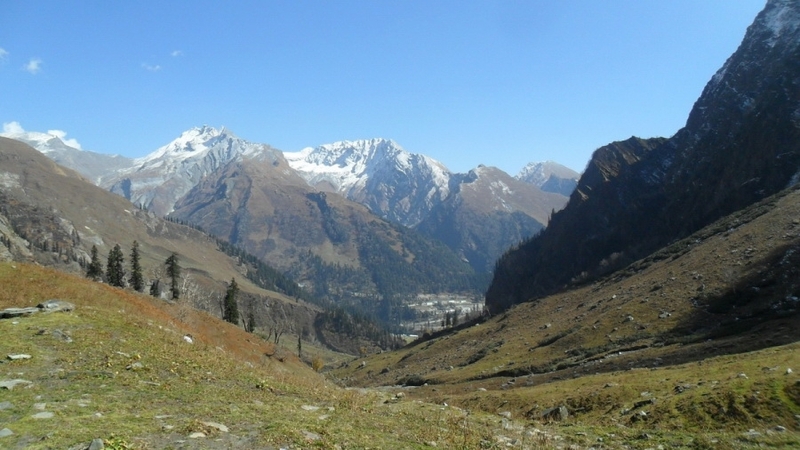 Lahaul valley region lies to the north of BeasKund just behind the great wall of these mountains. 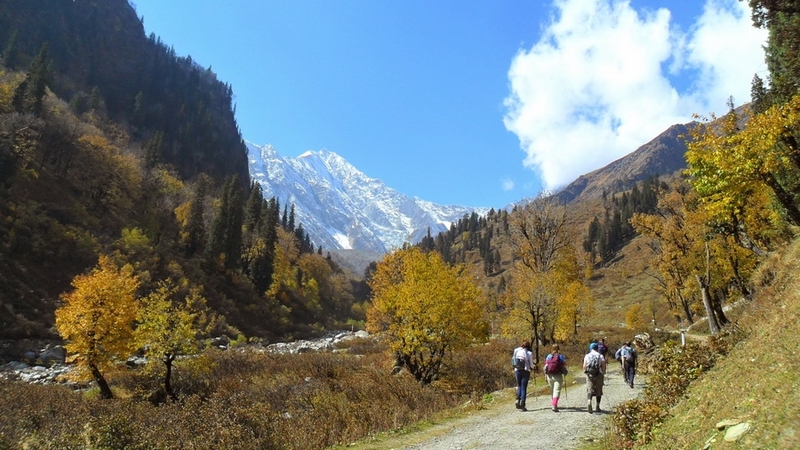 To the west Kangra and lower region of Himalaya known as Dhauladhar range. Visiting around the lake we retrace back to Bakarthach camp for overnight stay. 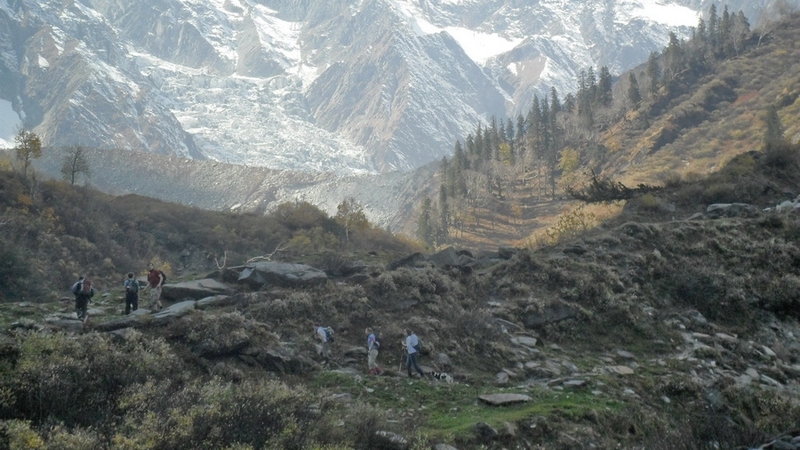 Today we descent gradually back to Dhundhi and further to Solang. 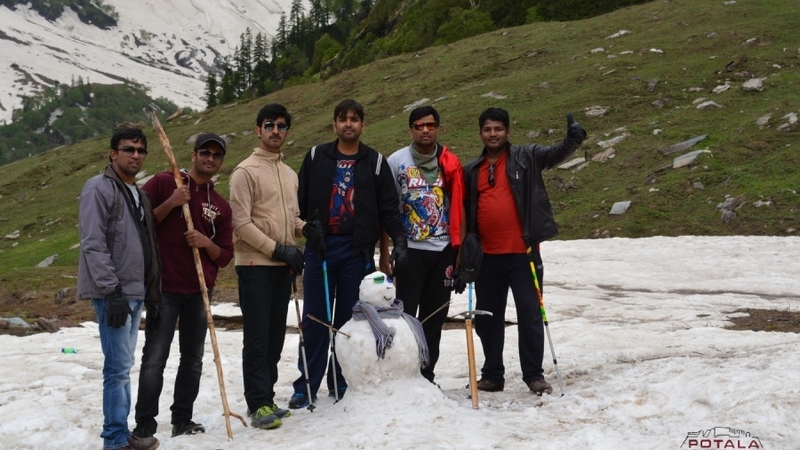 We spent few hours to explore the adventure activities at Solang. 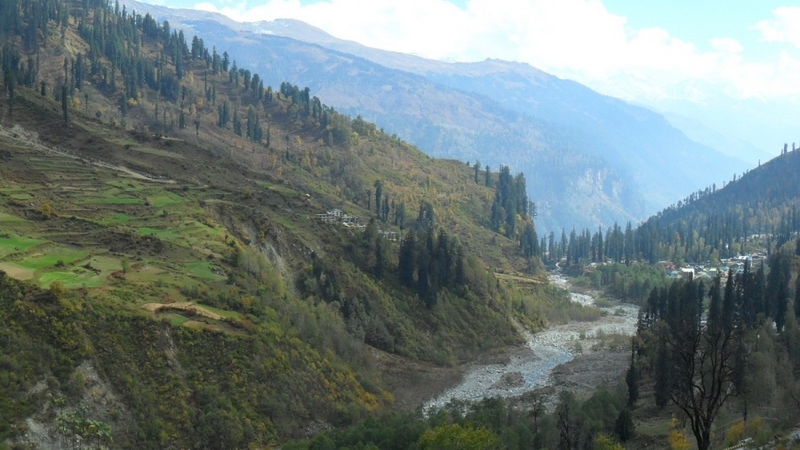 Drive back to Manali.